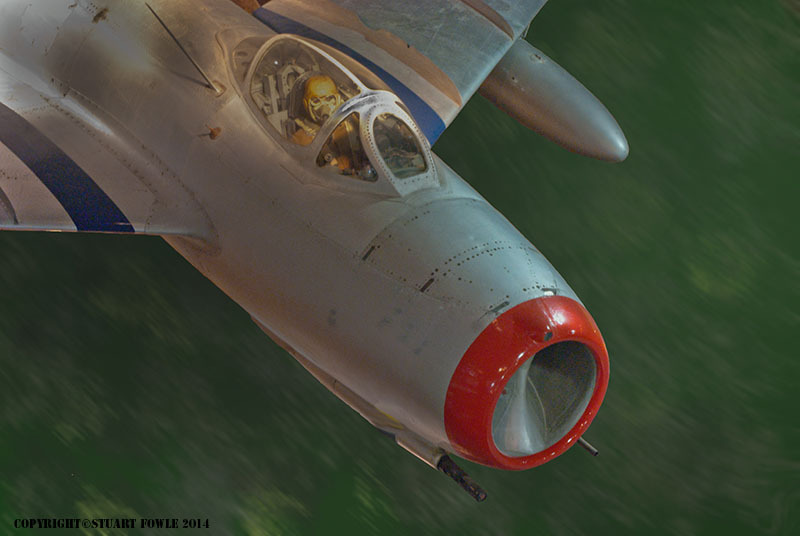 The Mig-15, the first jet to claim a jet verses jet kill, during the Korean war. The claim is that a Mig-15 (piloted by a Soviet pilot) brought down an F-80C, during an attack on a North Korean airfield. However, the USAF claim the F-80C was downed by ground fire. This is something I hope to investigate further, as it would make an ideal image for a drawing. On a similar note, the first confirmed (by both sides) jet verses jet combat where a plane was brought down was on the 9th Novemeber 1950 when a F9F Panther of VF-111 shot down a Mig-15. Interesting insight about these episodes can be found at http://www.korean-war.com/ussraircombat.html. 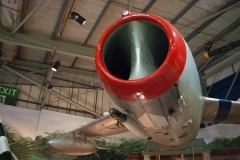 Built around a copy and redesigned version of the British supplied Rolls Royce "Nene" jet engine, the Mig-15 was a nasty surprise to the West when it made its combat debut in the skies over North Korea. 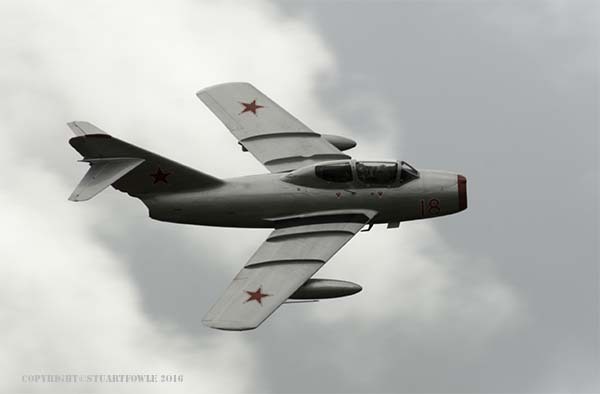 The Mig-15 entered service with the Soviet airforce in 1949, with and improved version, Mig-15bis following in 1950. 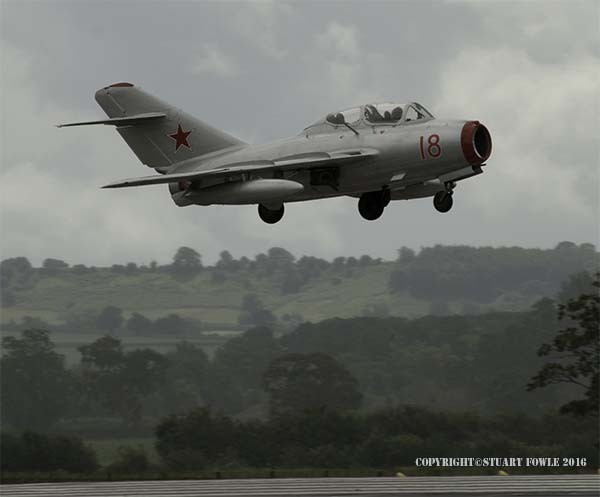 A 2 seat trainer version, the Mig-15UTI followed into service soon after. Mig-15's first saw combat in the Chinese civil war, when a Russian piloted Mig-15 shot down a Nationalist P-38 Lightning. 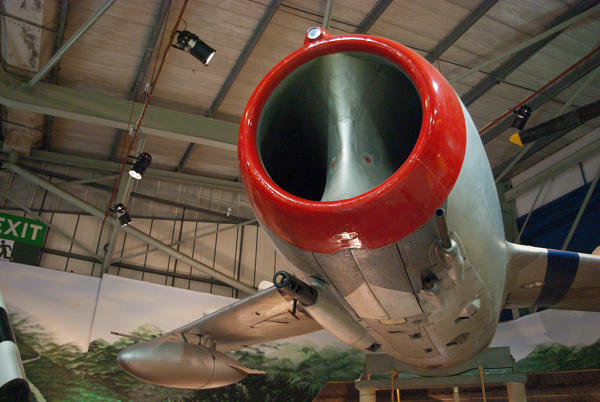 However the Mig-15 is better known for its role in the Korean war, and the air battles fought in "Mig Alley". It was during the Korean war, that jet verses jet combat first occurred, and the Mig-15 is the first jet to have downed another, when a Soviet piloted Mig-15 shot down a USAF F-80C Shooting Star. 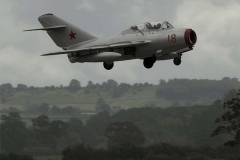 The Mig-15 has been used by many air forces and license built by Czechoslovakia and Poland. Albania Airforce Mig-15 1950 to ? Algeria Airforce Mig-15 1962 to ? Angola Airforce and Air Defence Force Mig-15 ? Burkina Faso Airforce Mig-15 ? Republic of Congo Airforce Mig-15 ? Czechoslovakia Airforce Mig-15 1953 to ? Vietnam (North) Airforce Mig-15 ? North Yemen Airforce Mig-15 ? Poland Airforce and Navy Mig-15 ? Sri Lanka Airforce Mig-15 ? www.skyfender.com video "Mikoyan-Gurevich MiG-15 Fagot Jet Fighter Aircraft"